The promises have not been met, the speeches are getting weary. Is the opposition Modi's biggest strength? On the second day of the BJP national council’s meet at Delhi’s Ramlila ground last month, many BJP leaders were given a message to ensure that the audience chanted ‘Modi, Modi, Modi’ intermittently through the day. The reason: they had been quiet the previous day, unmindful of the chants raised by two small groups of party workers strategically placed on both sides of the front rows. The effect of the message was evident not only at the Ramlila ground, but also in the Lok Sabha three weeks later, when ‘Modi, Modi, Modi’ rend the air after Union finance minister Piyush Goyal announced income tax rebate for people earning up to Rs 5 lakh a year. These chants were normal at Narendra Modi’s public meetings in the run-up to the 2014 Lok Sabha elections, and for a long time after that. They were not choreographed then. Modi’s sheer presence electrified the crowds. But 2019 is not 2014. The Prime Minister was obliquely telling his party colleagues to do some work on their own, too — he alone would not be enough to bring them back to power. British author Lance Price’s 2015 book, The Modi Effect: Inside Narendra Modi’s Campaign to Transform India, carries the PM’s interviews, in which he has called a spade a spade, saying how in 2014, the people wanted “a trusted name, not a party name”. 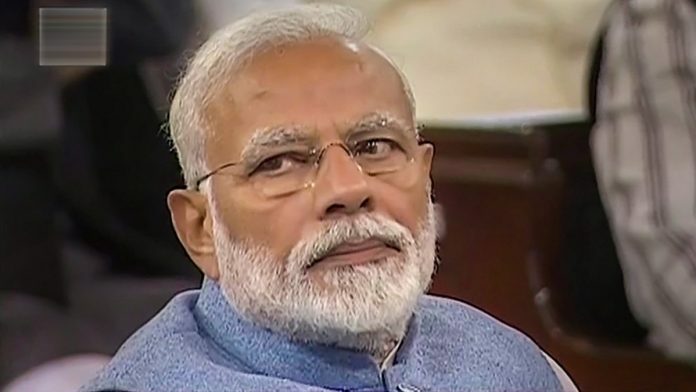 “In all corners of the country, they believed Modi was the only hope and wanted to see him win,” the Prime Minister was quoted as saying by the former BBCcorrespondent. Modi of 2014 was a relatively new phenomenon, with folklores galore about his so-called ‘Gujarat model of development’. Migrants from the Hindi heartland would return home with great stories about paani, bijli, sadak and everything else that their native land longed for. Contrary to what the left-liberals liked to believe, the 2002 post-Godhra riots had established Modi as a strong, decisive leader in the minds of many people outside Gujarat too. So, when in 2013, the then Gujarat chief minister made his “Independence Day speech” from Bhuj and talked about a “saas, bahu aur damaad” serial at the Centre and roared at Pakistan across the border, people lapped it up. To those weary of the tales of omissions and commissions of the then UPA government, Modi was a fresh whiff of air in national politics. They believed him when he promised to bring back black money stashed abroad and deposit Rs 15-20 lakh in their bank accounts. They believed him when he vowed to end corruption and replicate the Gujarat model across India. Their angst against the Congress got a new dimension when he spoke of “Shahzada” and “Delhi Sultanate”. And their chests swelled to ‘56 inches’ with pride as he threatened Pakistan with tough action. Cut to 2019, and the novelty factor is gone — from the persona as well as the oratory. Over the past two months, barely a day has passed without the PM addressing people, from official or non-official platforms. No wonder, then, that his last speech (of his current tenure) in the Lok Sabha on 7 February sounded repetitive: the same references to his poor background, dynastic politics in the opposition camp, his commitment to eradicate poverty and corruption, et al. People have heard his diatribes on corruption ad nauseam. They have no reason to think that opposition leaders are above board, but they aren’t so naïve as to not see a pattern in the central agencies’ FIRs and investigations against some of them. Five years ago, the then BJP prime ministerial candidate would frequently poke fun at the falling rupee and the state of the economy — that confidence and swagger is missing as the PM now talks about jobs and the economy. Modi’s personality cult has definitely eroded in the past fifty-five months, and so has his 2014 fan club. And that’s why he himself is anxious about his party colleagues’ over-reliance on him. But there are many other factors that could make up for this erosion. Modi’s dip in popularity, if any, among the youth could be supplemented by the new entrants in 2019 — the 13 crore first-time voters, of which a sizeable section seems enamoured of the Prime Minister. Then there are the 22 crore households that Modi claims have benefited from central schemes. The BJP has distributed the list of these beneficiaries down to its booth committees, to approach them and seek their support. If even one member from each household were to vote for the BJP, it would mean five crore more votes than what it got in 2014. The core support base of zealot Hindus remains intact. At a book release function on February 8, senior Congress leader Salman Khurshid lamented that “Muslims have gone silent and they are not even protesting.” This is good enough for some Hindus and the Sangh Parivar activists to keep the BJP-led government afloat at the Centre. And last but not the least, if the BJP succeeds in selling the Prime Minister’s “mahamilawat (great adulteration)” narrative about the “opportunistic alliance of anti-Modi” regional and national parties, people may opt for a tried and tested, stable option. What should keep the opposition’s hopes alive is that chants of ‘Modi, Modi, Modi’ no longer trigger the adrenaline rush they once did, and there are many ‘ifs’ in his bid for a second term. Persona is tired and hassled, oratory has proved to be untrustworthy. Mr Modi should take rest for one term and come back again in 2024 with charged batteries. He is belittling himself by looking so desperate. Can’t believe about message given for chanting Modi, Modi. Since the points are one & same, naturally the speech will be a routine one for any leader. However his charisma is continuing as front runner. Between 2014 and 2019, the major difference is that there is now a body of five years of work to judge the incumbent by. Personalities, charisma, oratory, all work upto a point. In material terms, does the average household feel its living standard has improved, does it now feel more filled with hope than it did five years ago. As far as these 22 crore households are concerned, a lot will depend on what actually was delivered. How many families are actually using LPG as fuel, able to afford this alternative. As far as Jan Dhan accounts are concerned, one third of a billion of them, their practical utility has been so imperceptible, few votes there. 2. It may be a small thing, but last night social media was filled with a clip of a speeding train tweeted by Rail Mantri. It was meant to showcase Make in India and the progress made by Indian Railways. Unfortunately, the speed of the train had been doubled. These things undermine creed and trust, do not play out well. Were 130 million children born between 1996 and 2001, who will now be voting for the first time ? And has our friend Yashwant Deshmukh done special polls to judge what their voting preferences will be, completely different from the rest of their families ? This seems to be an extremely partisan view. Various surveys and opinion polls do not indicate a steep fall in the popularity of Modi, as is being suggested in the article. . He still has an edge over Rahul in this regard. If the author is contemplating that entry of Priyanka Gandhi would drastically change this position, I think he is badly mistaken. It is a moot point, however, whether the Modi factor alone can make the BJP win 2019 elections. However, one thing seems to be almost certain, electoral defeat of Modi would not mean victory for the Congress.